Own your own rustic vacation! Welcome to Black Creek Enterprises. We are a family owned and operated business which specializes in storage sheds and cabins of all types. Our cabins make wonderful hunting camps or weekend getaways, our wood sheds or vinyl sheds are the perfect solution to your storage needs, and our gazebos will create your very own backyard paradise! Located in the beautiful mountains of Tioga county in North-central Pennsylvania, we serve Tioga, Bradford, and Potter counties, as well as the rest of Pennsylvania and surrounding states. 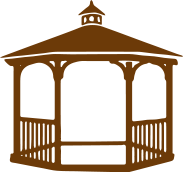 Our cabins, sheds, and gazebos come in many sizes and are available with countless options. Contact us with any questions you have or to get a quote on shed or cabin. Before you buy your next shed, come visit our lot and check out our outstanding quality and customer service; you’ll be glad you did! We have many satisfied customers in northern PA, southern NY and the surrounding areas.